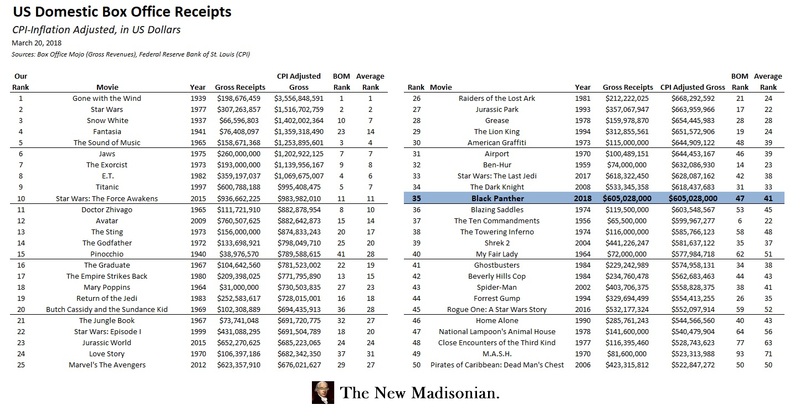 With Black Panther‘s immense popularity at the box office, we decided it was time to take a look at how it ranks among the all-time top US domestic grossing films. This is a less straight-forward task than it might sound. Due to inflation, raw box office receipts data is flawed. Therefore, we need to adjust the data. We will examine two methodologies for adjusting the data. Our data comes from Box Office Mojo which maintains a list of the top 300 grossing films of all-time. Box Office Mojo (“BOM”) has its own methodology for adjusting for inflation; it takes gross revenues and adjusts for average ticket price during the year of release. They then adjust that to the average ticket price for 2018. This methodology has some flaws; the most obvious of which is illustrated in the chart below. The 2018 average ticket price is $9.18, but when compared to inflation adjusted historical prices, we can see that movie ticket prices are very expensive historically. In fact, in 2018, movie ticket prices are near record-levels when adjusted for inflation. 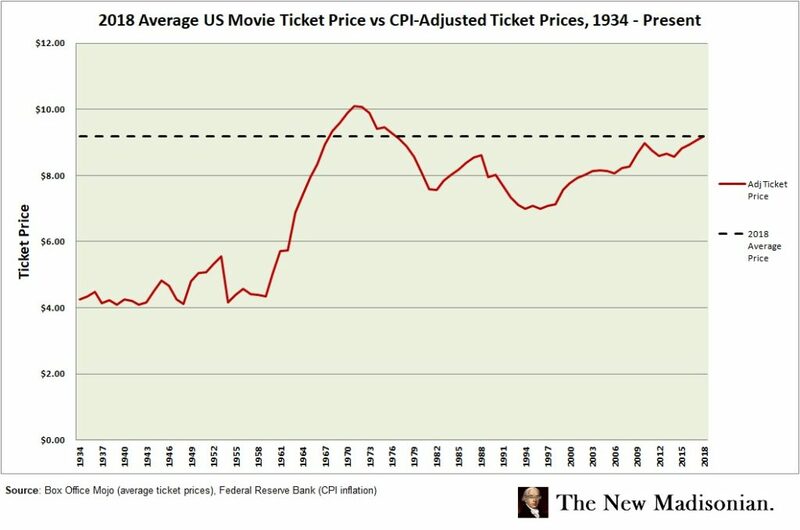 Moreover, movie ticket prices have been driven by major trends over the past 60 years. The 1960’s and 70’s where a “boom” period for movie ticket prices, while you could say the 90’s were a “bust” period. Indeed, in inflation-adjusted terms, it cost less to see a movie in 1994 than 1971 or 1978. Over the past two decades, though, the prices have seen a steady climb upwards. What does this mean for data purposes? In BOM’s methodology, films that were released during “high ticket price” eras are punished. A film that does well at a $9 average ticket price would have likely sold more tickets at $4 but BOM’s model does not account for this. Conversely, a film released when average inflation-adjusted ticket prices were $4 would likely have sold fewer tickets in a $9 or $10 average ticket price era. For most films, the differences aren’t huge, but we’ll see that a few movies have skewed results due to this issue. Nevertheless, BOM’s methodology provides an extremely useful comparison by examining number of tickets sold. We should mentally adjust for the fact that the methodology will inflate receipts for films in the 40’s, 50’s, 60’s, and 90’s, and understate receipts for films during high-price eras such as the 60’s, 70’s, and 10’s. In our methodology, we adjusted gross receipts for inflation using CPI data and the year the revenues were generated. This gives us a better picture of how movies have performed historically. We view this methodology as the best way to measure historical results. Finally, we average out the rankings of our methodology and the BOM methodology to create an “Average Rank.” None of these rankings are authoritative, but with all three measures, it should give us a pretty good sense of how well certain films have done historically. 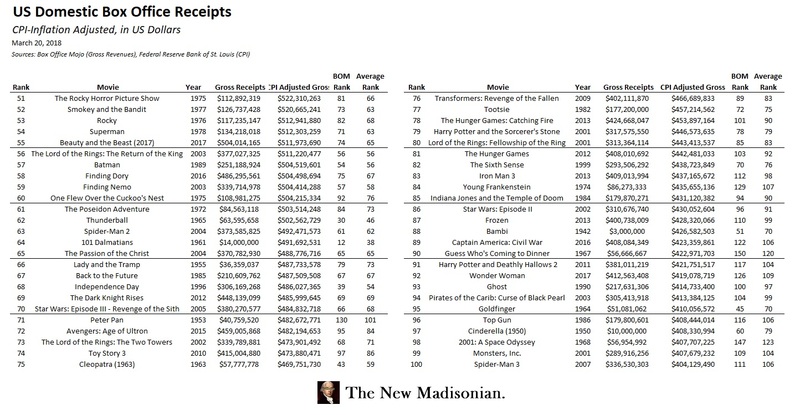 Without further adieu, we present the top 100 films by inflation-adjusted gross receipts in the two charts below. The movies are ordered based on our methodology ranking, but you can see the BOM ranking at the end, as well as the averaged-out ranking. Comparing how the two different methodologies perform is interesting. For some films, the results are very similar. Gone With the Wind is #1 under both methodologies. Star Wars: Episode 1 is at #22 in our methodology and #18 under BOM’s. Likewise, Grease is #28under our model and #28 in the BOM model. The films that appear the most skewed under the BOM methodology were released during low ticket price eras. Forrest Gump rated #44 in our model, but #26 in BOM’s. This seems like an odd disparity, but it’s explained by the fact that Forrest Gump was released in 1994. If you reference our ticket price chart, you’ll see that inflation-adjusted average ticket prices were lower in 1994 than any other year from 1963 – 2018. Thus, in the BOM model, Forrest Gump’s receipts get assigned a large multiplier that overestimates its true revenues. So it’s best to say that both metrics give us a general idea of how a movie performed, but both have their flaws. Other discrepancies include Fantasia, which our methodology rated #4 in all-time receipts, while BOM’s rated it #23. Part of the difference may be explained by the Fantasia re-issues in 1985 and 1990, which came during lower ticket price eras. However, this one is more difficult to explain as our inflation-adjusted revenues solely from the 1941 original release, exceed BOM’s ticket-price adjusted receipts. 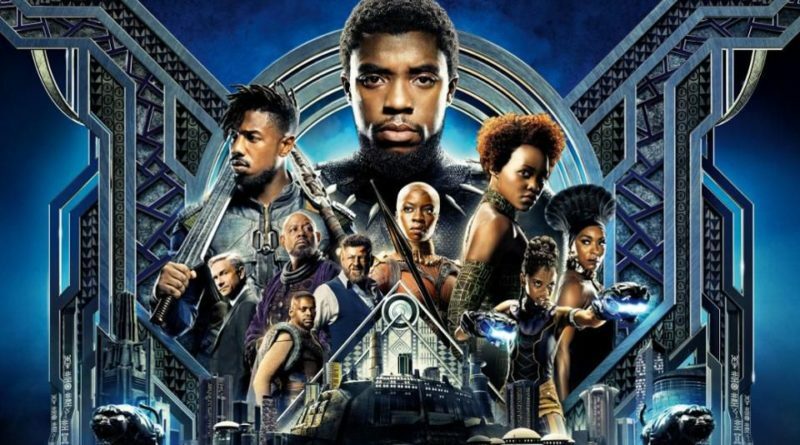 No matter how you analyze the data, you have to conclude that Marvel and Disney struck gold with Black Panther. When all is said and done, it will likely be in the same company as Return of the Jedi, Jurassic Park, and Raiders of the Lost Ark in terms of box office receipts. That’s impressive.